Chili is one of those nostalgic dishes for me. Growing up my dad would make a traditional ground beef and kidney bean chili topped with good ol’ American cheese and served over rice. It wasn’t the healthiest dish, but it sure tasted delicious. Now that I’m doing the cooking I try to do things a little more on the healthier side. 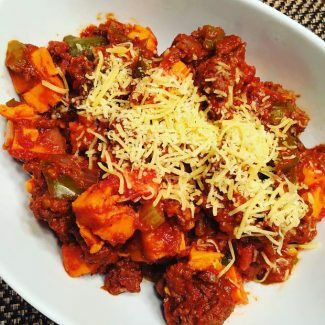 This recipe calls for ground elk and sweet potatoes, and the cheese is optional, making this dish dairy-free, gluten-free and paleo-friendly. If you’re a meat lover but are conscious about maintaining a healthy lifestyle, try cooking with ground elk. It’s low in fat, but full of flavor. I use Durham Ranch ground elk at Raley’s in the meat department. They always seem to have it in stock. Place the ground elk, bell peppers, onion, celery, garlic and seasoning in a slow cooker. Use a wooden spoon to break up the elk and mix everything together. Peel the sweet potatoes and chop into ½ inch cubes. Place the sweet potatoes on top of the mixture. Pour the stewed tomatoes over top the sweet potatoes. Cook on high for two to three hours or low for six hours. Every slow cooker is different, but once the potatoes are tender and the meat is cooked through, the chili is ready. Taste and season with more salt and pepper as desired. Place a scoop of chili in a bowl, sprinkle shredded cheddar cheese on top and serve warm.